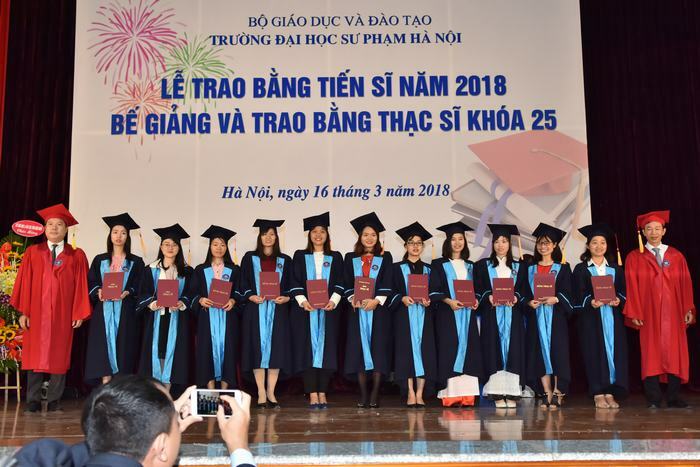 Attending the ceremony on the guests are Dr. Dinh Minh Tam – President of Tay Bac University; Prof. Nguyen Thi Thu Hang – Vice President of Institute of Education Management; On behalf of the school, there are Prof. Nguyen Van Minh - President of University; Assoc. Dang Xuan Thu – Secretary of Party Committee and Vice President; Prof. Do Viet Hung - Vice President; members in the Party Committee and the Board of trustees ; members are leaders of organizations and units in the whole school, postgraduate assistants of faculties; teachers who are instructors, guests and more than 1400 new doctors, new masters who are honored to receive degree this term. Wish all new doctors and masters receiving graduate degree today to keep contributing and devoting for field and the society to be a proud part of Hanoi National University of Education!